Cornelius Shields received 53 acres located north of Deep River on Cane Patch Creek adjoining his own line, White and Beeson. Fannon Moore and Wm. Shields were chain carriers. Chas. Hardin v. Fanning Moore. Defendant is now deceased, and it is ordered that notice be served on the children and heirs at law by placing in the NC Argus for six weeks for heirs living beyond the limits of the state. 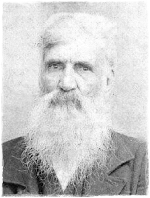 "In Moore County, on the 12th [Feb 1857], Fannin Moore, aged 83 years." Estate of Fanning Moore, Dec'd. by Administrator Z.B. Moore. Items were purchased by the following: George Moore, J.A. Scott, R. Phillips, Thos. Dixon and Jas. Moore. Charles Hardin. v. Fannie Moore. Appearing that Joseph Moore, Robert Moore and Patrick Moore are heirs at law of Fannie [Fanning] Moore, Dec'd. and are not inhabitants of the state. They are summoned to appear at the courthouse in Carthage next August.